In 1979, Ridley Scott made his first journey into to space with Alien, a landmark movie that spawned sequels and turned the universe into a source of abiding terror. Rather than harboring wondrous possibilities for communication with alien life (see Steven Spielberg’s Close Encounters of the Third Kind), Alien introduced us to acid-drooling monsters that hatched inside human bodies. In 2012’s Prometheus, Scott returned to space with a competent movie, but one that failed to gather Alien’s cultural steam. The same might be said about Scott’s The Martian, but it’s a much better movie than Prometheus, and its view of what awaits us in space may be more realistic; i.e., nothing but hardship and emptiness. The story centers on a mission to Mars in which an early picture twist leaves botanist Mark Watney (Matt Damon) abandoned on the planet’s desolate surface. Believing Watney to be dead, his companions on the Ares III mission head back toward Earth. Watney must use all his scientific knowledge and ingenuity if he’s going to have a chance at survival. Despite its stark setting, the resultant film goes against the dystopian grain that distinguishes most contemporary sci-fi. The longer The Martian goes on, the more it becomes clear that Scott is making his ode to science. Brains, not brawn, give Watney a chance. I don’t know if the science in The Martian will make scientists happy. I’m hopeful that astrophysicist Neil deGrasse Tyson will weigh in on the subject as he did on Gravity, a movie he didn’t like. But Scott has gone to great lengths to make the movie feel scientifically plausible, and from a dramatic point of view that’s more important than turning the screen into a 3D science lesson. Based on popular novel by Andy Weir, the story also makes us aware of what’s happening on Earth. The head of NASA (Jeff Daniels) tries to figure out how to keep his program viable while hatching a rescue plan. Daniels is joined by Chiwetel Ejiofor and Kristen Wiig in his efforts to determine whether Watney can be saved. From time to time, we also check in on the crew that’s headed back to Earth under the guidance of Commander Lewis (Jessica Chastain). Also on board the spaceship that fled the Martian storm believed to have killed Watney are astronauts played by Kate Mara, Sean Bean, Sebastian Stan and Michael Peña. Watney, who talks to himself for a long time before he discovers how to communicate with Earth, narrates some of the story. These "chats" add self-reflective humor to the proceedings and don’t really intrude on the story, which addresses three important questions: How will Watney deal with problems revolving involving diminishing supplies of food, air and water? 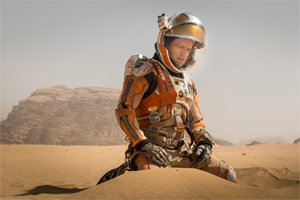 As a piece of filmmaking, The Martian is more clear-eyed than visionary. It’s weighed down by an unnecessary epilogue that follows the tense finale with enough white-knuckle potential to satisfy action junkies. Scott makes witty use of Gloria Gaynor’s I Will Survive and other ’70s disco music, and receives a strong assist from cinematographer Darisuz Wolski, who makes reasonable — if not dazzling — use of 3D. For the most part, Scott maintains focus. He doesn’t suggest that science will save us, but builds an exciting entertainment around the notion that some problems are best solved by knowledge, cooperation and courage bred of necessity. No weapons required. I’d call that both a profession of faith and a relief.